Getting a good night’s sleep is crucial to good health. Sleep allows your brain to rest and process information. It also gives your body a chance to rest. But many people have a hard time getting a good night’s rest. In this article, we’ll give you tips to help you get the sleep you need to stay healthy and be alert in the morning. Going to bed at the same time every night helps your mind and body get into a routine. If you go to bed at, say, 10:00 every night for a week, you’ll soon start to find that you get tired at that time without even thinking about it. This can also help you get a full night’s rest, as you can figure out when you need to go to sleep in order to get the eight hours of rest your body needs. Experts now recommend that you stop using electronics, such as cell phones, tablets, computers, and even TVs, at least an hour before you go to bed. That’s because the blue light emitted by these screens is similar to natural sunlight and tricks your brain into staying awake longer even when you’re trying to sleep. If your mattress is more than eight years old, odds are, you’re not getting the best sleep you could get. Over time, the coils in spring mattresses break down and even memory foam mattresses lose their ability to absorb shock. An older mattress isn’t going to give you the same support that a new mattress will. Plus, if you haven’t been mattress shopping in the past 10 years, you may be surprised at the new technology available and the price decreases for memory foam mattresses. If you’re drinking too many cups of coffee or pounding down energy drinks constantly during the day, you might be hurting your ability to get a good night’s sleep. This is especially true if you consume caffeine later in the afternoon. A cup of coffee after lunch might perk you up for the moment, but its effects last longer than you may realize. Try to stop drinking coffee or other caffeinated beverages, including soda, about six hours before you want to go to sleep. This will give the caffeine time to exit your system, allowing you to fall asleep easier. Exercise is good for your body and your brain, and it provides numerous benefits. A good workout can help you get rid of excess energy and sleep better through the night. However, working out too late can keep you up later. Have you ever noticed that right after a workout, you get a boost of energy? That’s from the endorphins, a chemical in your body that makes you feel good when you do something like exercise. But this feeling can also make it hard to settle down and go to sleep. Stick to morning workouts and avoid exercising in the late afternoon or evening hours. 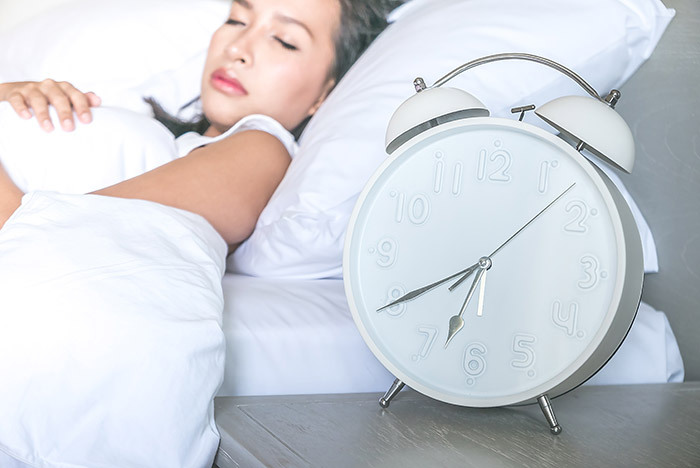 Follow these five tips, and you’re sure to notice your quality of sleep improving dramatically in just a few weeks or days. Remember, sleeping well is one of the most important things you can do for your health and well-being.